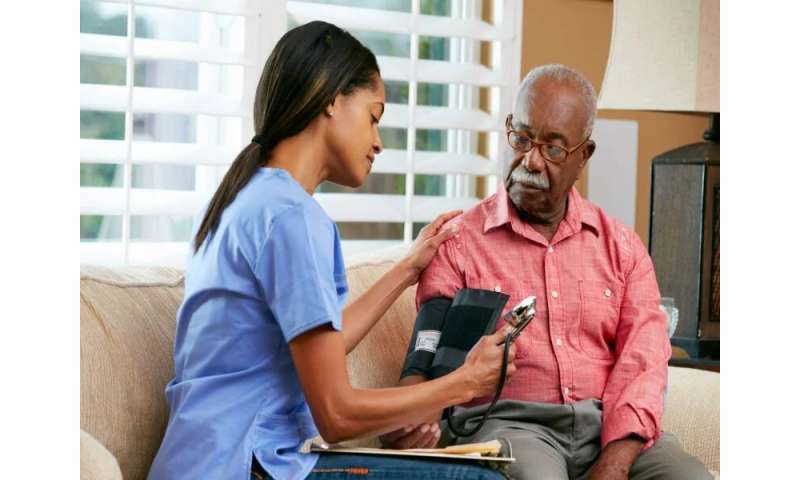 (HealthDay)—Normalized blood pressure (BP) is associated with an increased risk for all-cause mortality for older adults during hypertension treatment, with increased risk seen in octogenarians and those with previous cardiovascular events, according to a study recently published in the European Heart Journal. Antonios Douros, M.D., from the Universitätmedizin Berlin, and colleagues examined the correlation of BP values less than 140/90 mm Hg during antihypertensive treatment with the risk for all-cause mortality in a cohort of 1,628 patients aged ≥70 years. The researchers found that 636 of the patients exhibited normalized BP. Overall, 469 patients died during 8,853 person-years of follow-up. Normalized BP (<140/<90 mm Hg) correlated with an increased risk for all-cause mortality compared with non-normalized BP (≥140/≥90 mm Hg; incidence rates, 60.3 versus 48.5 per 1,000 person-years; hazard ratio, 1.26). Risks were increased in patients aged ≥80 years (102.2 versus 77.5 per 1,000 person-years; hazard ratio, 1.40) and in patients with previous cardiovascular events (98.3 versus 63.6 per 1,000 person-years; hazard ratio, 1.61). Risks were not increased among patients aged 70 to 79 years or for those without previous cardiovascular events. "Given the scarcity of randomized controlled trials in elderly populations and the challenges regarding the generalization of their results in real-world clinical practice, careful individualized clinical assessment of potential benefits, and harms of antihypertensive treatment should guide physician decision-making," the authors write.